Hamilton Island is situated in the middle of the Whitsunday Islands and is the most developed and commercial of all the islands with regular national flights to its airport and a busy marina. 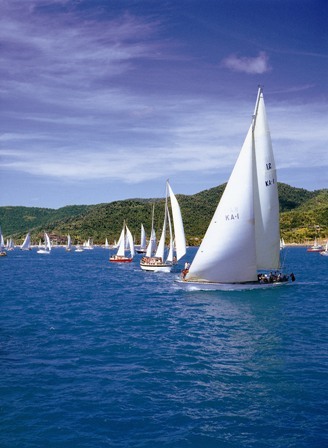 One of its main claims to fame is the Hamilton Island Race week! It has become renowned as Australia's blue ribbon sailing regatta and largest offshore yachting event which attracts hundreds of famous yachts both nationally and internationally. In Australia they head north each year to enjoy a week of great racing and serious partying; it’s become a sailing institution over the last 25 years! 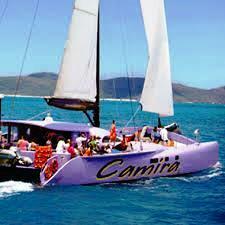 Sailing Whitsunday Islands at this time of year is electric the excitement is full on! It started in 1984 with just three divisions and less than 100 yachts and has grown to 225 yachts in 2008 becoming one of the most competitive and enjoyable racing to be held at any regatta in the world. There are four races and nine different classes of vessels participating. There is also a fun racing series for cruising yachts. 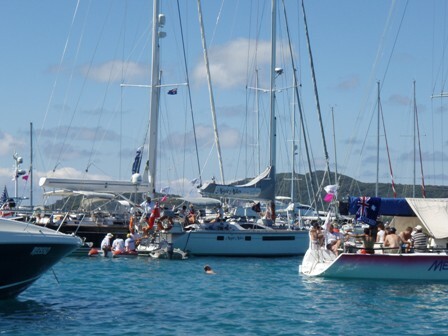 The races are the South Molle/ Daydream Island race, the Coral Sea race, the Edward Island race and the Lindeman Island race. The classes are the IRC grand prix class for top class racers, the one design class, the performance grand prix class, the premier passage class for modern fast cruising yachts over 14 meters, the IRC passage class for cruising yachts under 14 meters, the performance passage class, the classic class for boats that were built for racing prior to 1978, the cruising class for all types of cruising yachts and the non spinnaker class. There are Windward, Leeward’s & Short Around Islands Races too. The longest and most grueling race, the Club Marine Classic Hayman Island Race, is 59 nautical miles long and often sees a few dramas. Women get involved in different divisions, they are definitely not just figure heads like in the past bare breasted and leaning off the bow. The cruising class is the most popular division and is all about having fun. How competitive you want to be depends on the division you enter, and dare I say how much partying you’ve done the night before! If you do not want to use your own yacht or have flown in for the event but still want to get involved and be part of the experience there is a way! Even if you don’t have a yacht or racing experience you can be a part of this amazing event. Sunsails Charter Company has what they call their singles yacht sailed under supervision with an experienced instructor who shows you the ropes and racing skills and this would be not just a life experience, but a way to improve your cruising skills. Most people live aboard their yacht during race week and the marina becomes a vibrant and fun place to be. You will find because of the large number of participants in the race a certain amount of rafting has to take place. 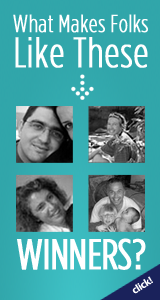 Facilities include showers, toilets, laundry, internet and repairs. And the good news is marina berths are free for contestants, book ahead if you intend to stay there and you’re not. If there are no berths available or you are not comfortable with high cost marina fees consider an anchorage at one of the near by islands, even Whitehaven beach. You would still be right in the heart of all the action. There’s a shop at the marina with limited supplies of groceries, but its best and cheaper to get your provisions from the main land. There are some good supermarkets in Cannonvale, and its best to buy alcohol here too. If you run low there is a bottle shop near the marina with a limited wine selection. Restaurants and al-fresco eateries circle the shore next to the Hamilton Island Marina and if you want to get around and experience Hamilton Island resort facilities hire a golf cart, it is the only way to go, there are plenty to hire right besides the marina. From the presentation dinner, very flash with entertainment that continues on into the night and festivities at the Marina Tavern literally rocking the night away, this is just the start of Hamilton Island race week and some fun sailing and one long party. There’s a Beneteau Sailing Club Lunch put on last year at the Mariners Restaurant. A Moet and Chardonnay lunch at the Beach House. Where both racing yachts and local boats meet at one of the best beaches in the world, what for? …………… To party some more of course! Whitehaven beach revellers turn there heads sky wards for the RAAF Roulettes most magnificent aerial display flying over the beach to the delight of the partying crowd. There’s live music, and dress up antics that take place. Do the Aussies know how to combine racing and partying? It was estimated that 20,000 schooners of beer were drank, 2000 cases of beer, and thousands of shots of spirits and bottles of wine with no fighting ...... just fun in the sun! 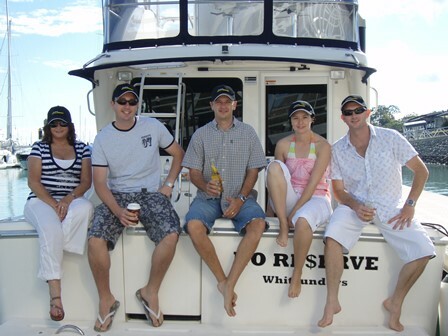 Whether you are on the mainland in Airlie Beach or on Hamilton Island during race week; if you are a serious racing sailor or just a cruiser like me Hamilton Island Race week is an experience you will never forget! Just part of the beauty and excitement of the Whitsunday Islands. Whitehaven Day, myself and work mates!